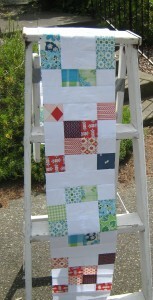 One of the fun projects that I did last year was a Cube Quilt Along. I own an AccuQuilt cutting system and one of the products that they sell is a Cube. This is actually how the dies are packaged, in a cube. Each cube set has dies that create a specific size finished quilting block. The block size that I chose to use last year was the 8″ cube and the classic companion set which is an extra set of dies that coordinates to make a lager variety of blocks in each size. 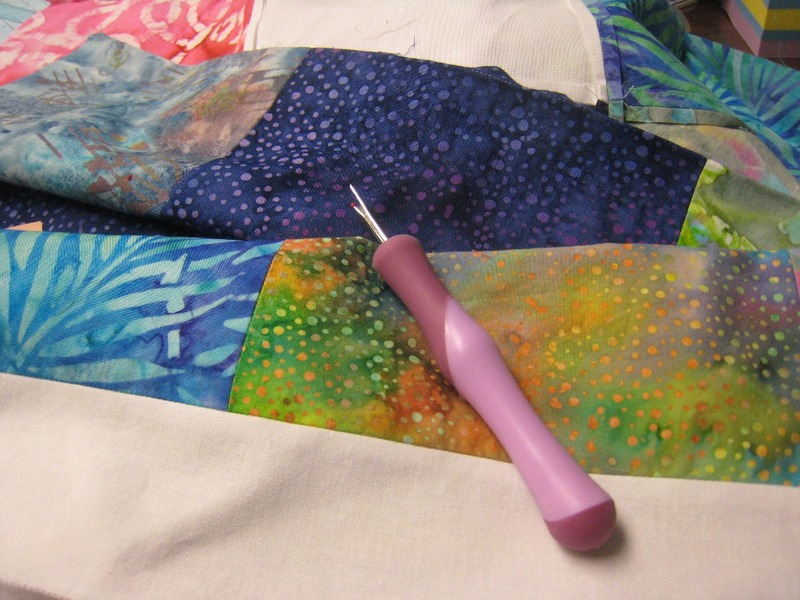 Although I’ve owned the AccuQuilt cutter for several years, and I’ve sewed for many many years, I’ve never done much quilting. 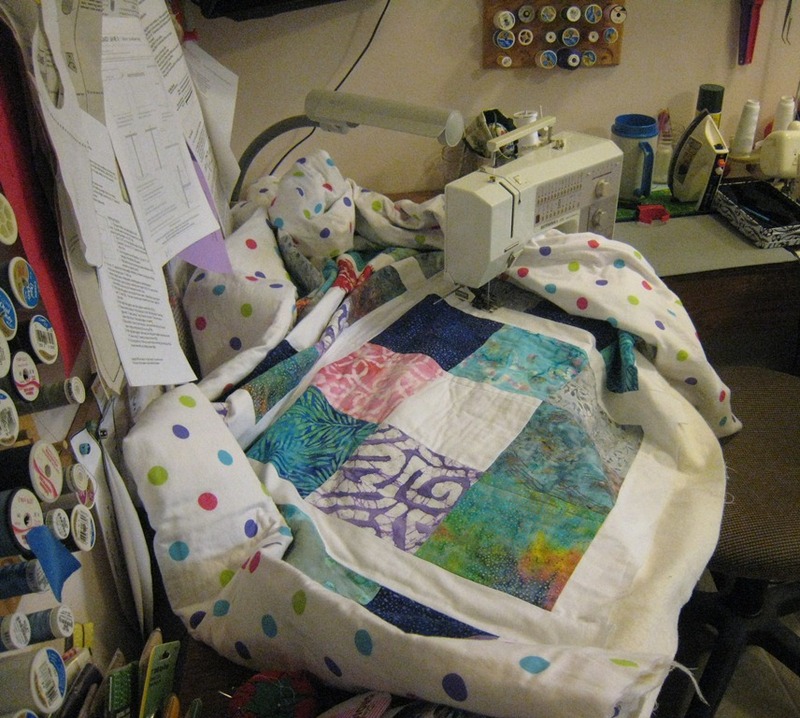 This cube quilt along was a wonderful way for me to learn and practice more quilting. 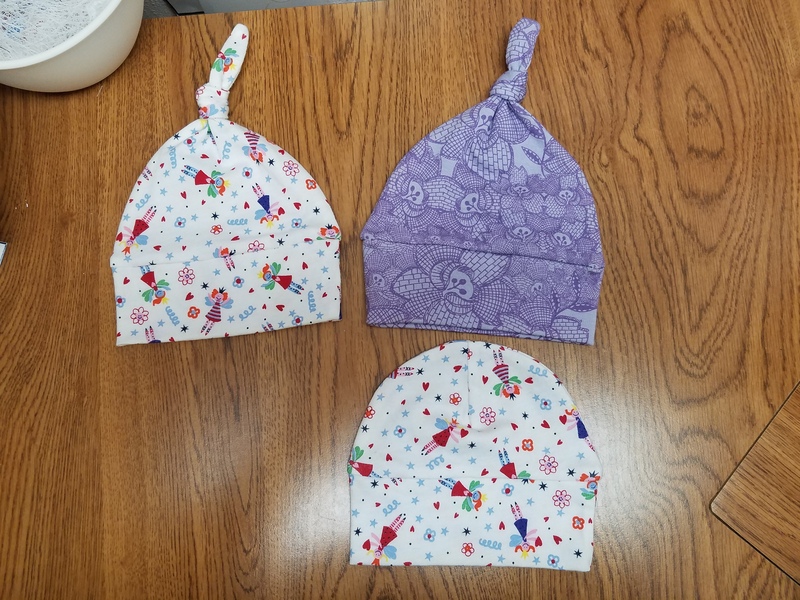 I worked on a consistent seam allowance and learned how the shapes worked together to form blocks. The other thing that I got to practice was learning more about color placement and color values. Each week for 48 weeks Bea of Beaquilter provided instructions for a new block. It was fun to look forward to and nice to only have one block to do. Here is a picture of the entire set of 48 blocks. I guess I only have a picture of 42 of the blocks. I’ve got the rest pinned together and this weekend hope to get the rest done and sandwiched for quilting. I may decide to send it out however because it will be difficult for me to quilt on my machine and makes my shoulder hurt. 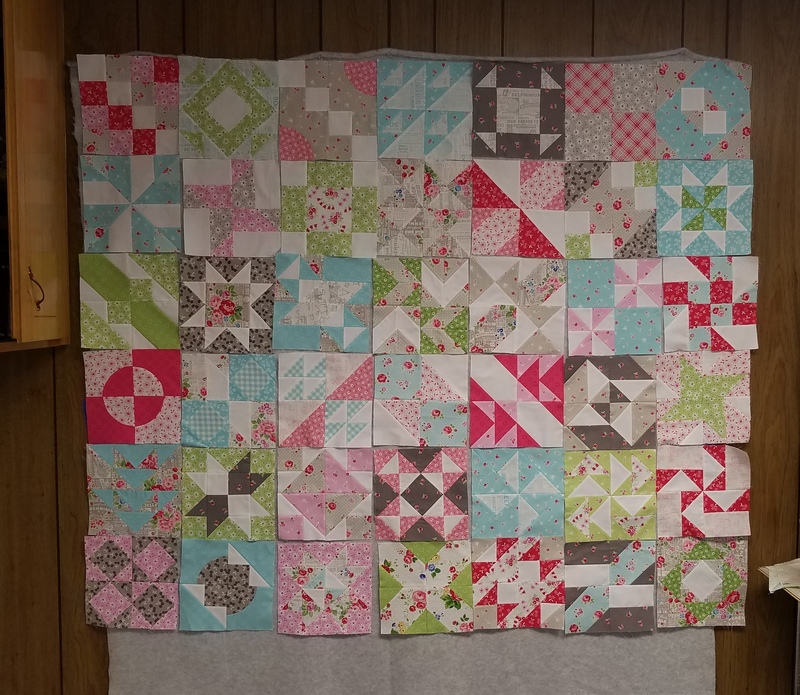 I’m looking forward to the finish and am now working on the 2018 Cube quilt along. 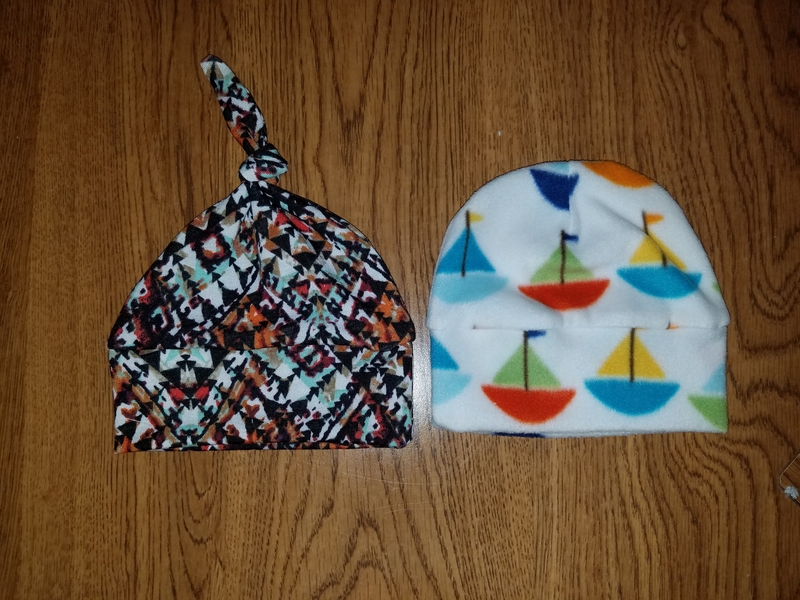 This year I’m using two entirely different color schemes and doing one with 9″ blocks and one with 12″ blocks. So far, I’ve enjoyed this as well. Remember the old hangers that used to be in everyone’s closet? You know the kind I mean. The wire ones your mom got from the cleaners. Sometimes they were colored and I loved those. I remember one turquoise one that I used to have. Sometimes they were white but mostly they were gold or gray or just metal colored. The other hangers that were special were the ones with the cardboard tube at the bottom that you could use for slacks. We didn’t have too many of those and they were used only for the best pieces that you didn’t want creases in. Well in my latest sewing project I kept wishing that I had a slacks hanger. The kind I was thinking about was a wooden one that hubby had when we were first married. I think they were from his wedding suit and it not only was sturdy wood but had a moveable bar on the bottom that you could unhook to slide the slacks on and then hook it back together and put it in the closet. 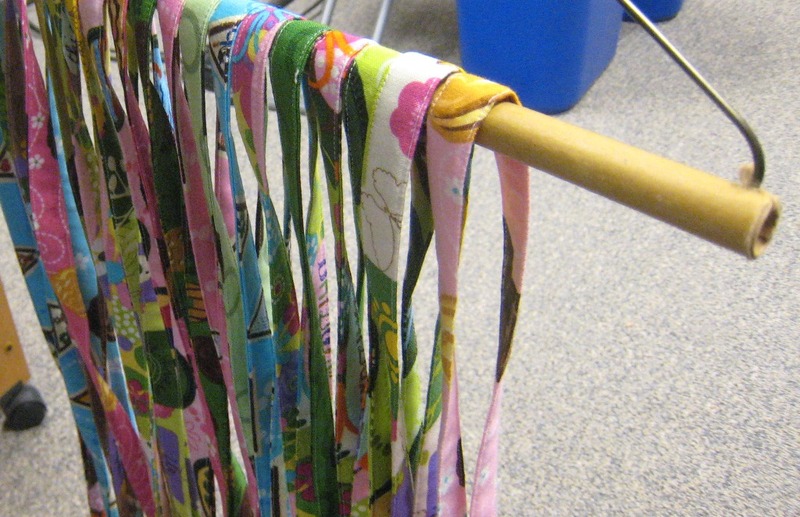 We have moved to mostly wash and wear and plastic hangers and I haven’t thought much about hangers until recently when I wanted to hang the latest sewing project. The project was circles of fabric that I wanted to slide over something and hang. I couldn’t justify taking the old wooden hanger that now holds other slacks of hubby but lo and behold when I opened the coat closet door, I found a secret stash in the far back. There it was, the perfect hanger! It is wire with a sturdy cardboard tube. Happy day! Now my circles are hung waiting for delivery and I am remembering more good times and special hangers. Third times a charm.. or is it? In this case.. not entirely. 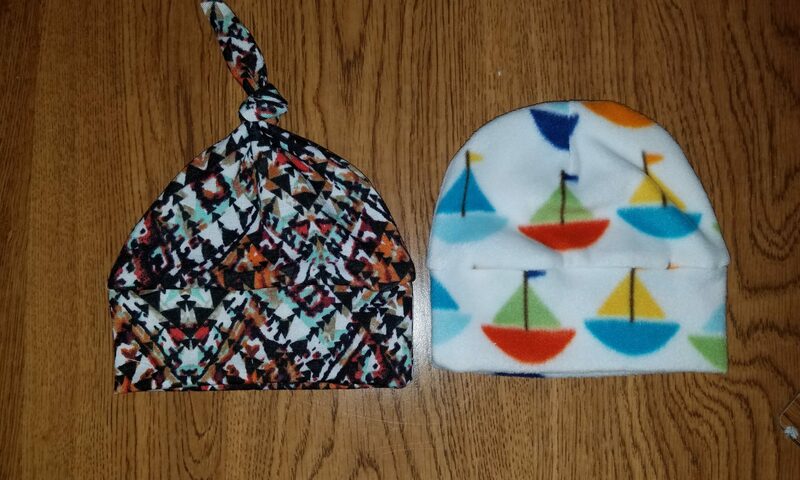 The process of a smaller bag is closer but not quite there. This time I think I didn’t have the iron quite hot enough so the fabric is laminated but I’ve noticed as I was sewing it seems to be loose in a few places. This has happened as I was sewing so it seems the adhesion was good but not good enough. The size of the bag seems to be fine and I should be able to fine tune it so next time is good. 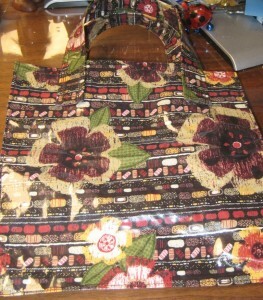 The fabric is cute and the function will be fine but the durability of this bag is in question. Onward and upward for number 4! I’m working on a new table runner. 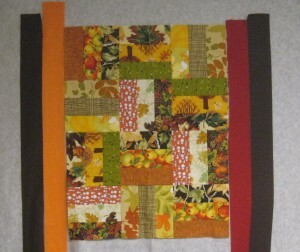 I decided to do a split rail pattern with fall colors. This is not my usual color choice but I’m liking it and think it will be good. 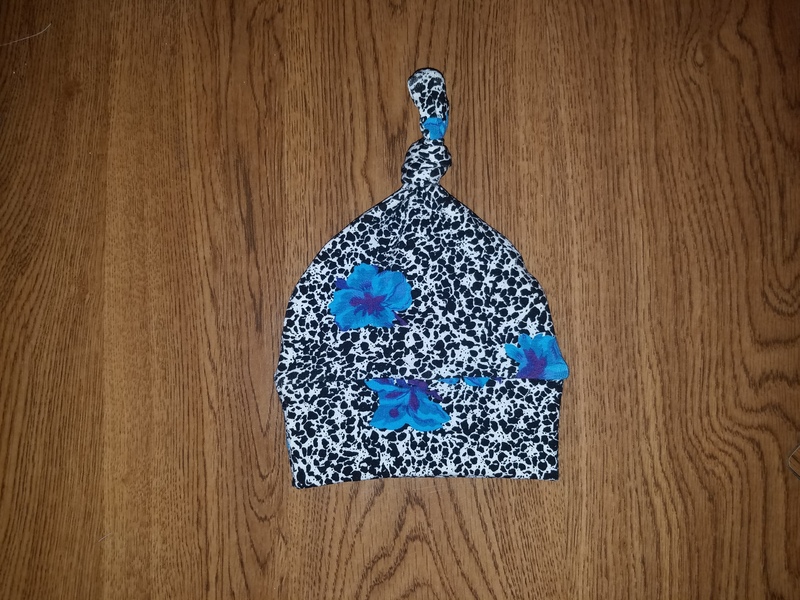 I want to put a border on it before I bind it but not sure of the color. These were the fist choices. Not sure either one is quite right so will continue to think about it. Any thoughts? I’ve made it this far. It’s in the machine being quilted. It’s a bit bulky to fit through the machine but so far so good and I think (hope) it will go quickly and without too many problems. I just have to keep reminding myself that it’s ok if it’s not perfect. I’m not entering it in a contest to be judged, it’s just going to be used to cuddle on the couch with and that will be fine! 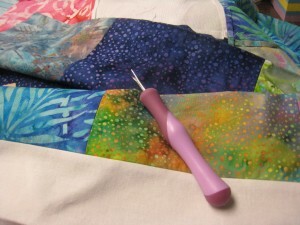 My seam ripper is my friend! My friend the seam ripper (unfortunately) has been used several times in the last few days. First it was the iron spitting brown stuff on one of the sashing strips. I was able to sponge most of it off but after a good night sleep, I decided it really did need to be replaced. First thing this morning that’s what I did. 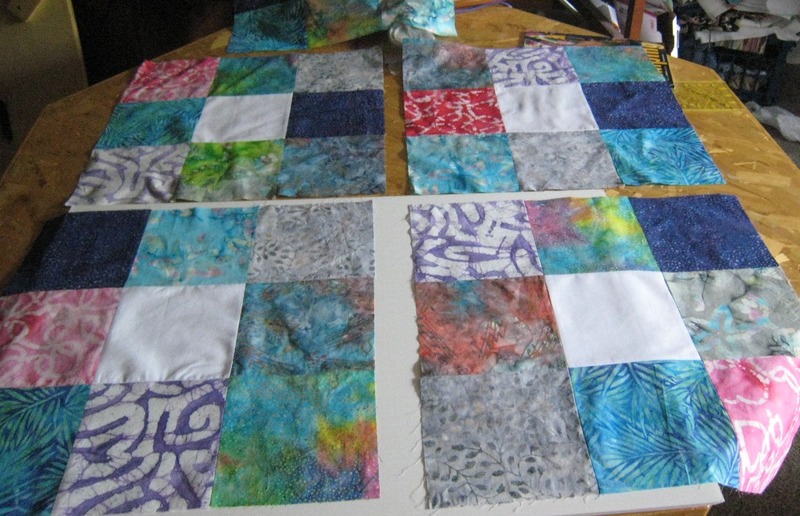 I also started some clothes washing, washed the sheet that I am going to use for the backing, cut all the sashing strips for the rows and cut all of the binding strips. That is after I checked my measurements many times. I’ve now started to sew all the rows together and guess what I discovered. I sewed the nine patch square to the wrong side. 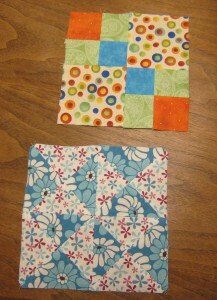 In other words upside down which meant that I ended up with two squares of the same fabric together. I was going to start ripping off the sashing and flip it around when I realized that if I chose a different seam, I would only have to rip or unsew as some say, one seam rather than two. So I’m sitting here ripping seams and ripping a book CD to my computer so I can put it on my iPod and listen to a story while I sew. I do have a tv in my sewing room and do watch that but when I’m sewing it’s really more about listening rather than watching. So hard to watch the seams and the TV. Now I’ve finished the seam and ready to head back to the machine before I have to go and help my mother. She’s then going to come here for dinner. Ribs and corn on the cob. Should be yummy! I’m on to another project before I finish my own lap quilt. I have another wedding gift to make. I almost have the top pieced and then I can add the batting and quilt. I think it will look fine once I have the sashing on and the binding but as with all projects… time will tell. Been a while since I’ve updated this blog. I’ve been busy with things like a trip to Portland, getting ready for camp, Father’s Day and trips to the ER with a sick kid upgrading a computer and oh yes, a bit of work, laundry and other assorted items.. All interesting in different ways! None of this however has kept me from investing in a bit of fabric and doing a bit of sewing. 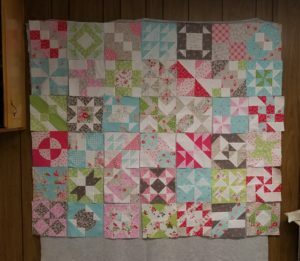 I have almost all of the rows together for my x’s and o’s quilt and am anxious to get back to that. This probably isn’t going to be the week for that however. Probably not until the end of month. I have also started another project. It’s called The Farmers Wife Quilt Sampler Quilt. I’ve been watching as folks all over blog land have been joining this quilt along and I decided that maybe I should do this at my own pace. It’s based on letters from 1920 farm wives and it contains 111 blocks they inspired. Bloggers I have noticed have talked about doing 2 blocks a week and so far I’ve had fun. I’ve just finished my first 4. Here again, there will probably be no more until close to the end of the month but I look forward to the process. I’ve enjoyed it for several reasons. 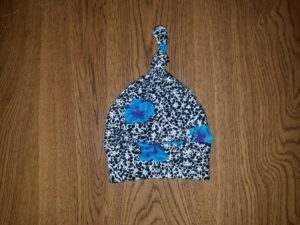 I think it’s been a bit more like fashion sewing because there is a specific pattern and template pieces. It has been interesting to try to keep the accuracy up as I trace and cut the pieces with the scissors but I’ve enjoyed the very small projects and sense of accomplishment when they are done. We are still waiting for summer to arrive but at least today there was sun. We were out for a drive and bought some fresh fruit so I think tomorrow there will be strawberry jam. I just unearthed the jam jars from the storage room and now have to go and read the directions on the pectin box. I’ll make freezer jam and will probably need to go and buy some sugar and lemon juice before I start. Well, finally after a long time I’ve finished the first row of this quilt top. I’m pleased with the way it’s coming together and the squares are all fairly even. I decided I need to use the same foot with the same settings and then all the seams are the same width and much easier to line up. 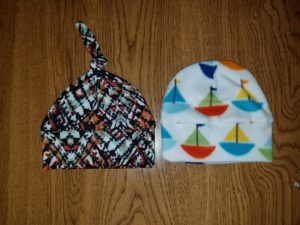 When I was sewing clothing there didn’t seem to be so many decisions but I suppose the reality was that I had done that for so long I didn’t really think about the tools, only the process. I really think the next quilt will go faster because there will not be so much decision making involved when I get to the actual sewing process. 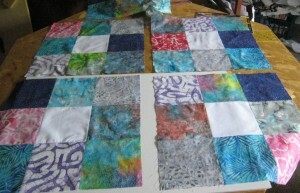 Now I have to finish cutting the sashing strips for the rest of the quilt and I can finish this part and move on. I’ve done the math, ironed the fabric and look forward to the finish.